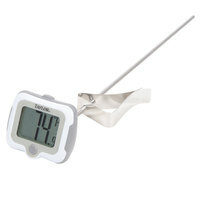 A thermometer is an essential part of any kitchen, and this Taylor 9839-15 candy / deep fry thermometer is no exception! Featuring a 9" stainless steel stem and included pan clip, this thermometer can be easily attached to whatever pan you're cooking in to keep your hands free while you monitor temperature. Its 1" LCD display offers a clear digital readout of temperatures from -40 to 450 degrees Fahrenheit. A candy makers must have! The only thing I dislike is the metal piece that holds the thermometer to the pot is a little wonky, but it works great and keeps your hands away from the flame. I love this thermometer. But the battery started to leak after a week due to heat. It is high quality. But other than the battery problem ill definitely will not hesitate to buy more. Got this item about a month ago. It has worked as advertised the few times that I have had the need to use the item. So far, I would buy it again. Works well enough, make sure to use with an appropriately sized pot. Sometimes the screen still fogs up while using and it is hard to see the temperature. I have a 4 inch thermometer with no clip. It worked fine when I was using induction burners, but gas stoves are hot. It was to hard to hold the thermometer that close to the flame, so I needed a new tool. This Taylor thermometer is twice as long as my old one and it has a clip, I can just clip it one to the pot and not burn my hand, just be careful not to hit the probe to hard and knock the whole thing in the pot, or flame. This thermometer also has a pretty large digital screen that I can read form a few feet away. This was the worst designed candy thermometer I have ever used. The pan clip was designed poorly so that the thermometer made contact with the pan. This gave faulty readings and the pan clip could not be adjusted. First time using a candy/deep fry thermometer and I love it. This one has a simple button on the back to switch between Celsius and Fahrenheit. The only thing is that the clip isn't super dependable. But it is great nonetheless. I was not satisfied with this product. After reading the instructions numerous time, I could never get the temp to "set". However, it is a pretty sturdy product. Just a little difficult to make it work. This is probably the best digital thermometer i have had. The numbers are big so your not trying hard to see what your reading all the time. Also the clip is great because then you can walk away, and it actually stays on the pan and doesn't fall off. I love this thermometer! The digital display is very easy to read, and the clip/adjustable head is great to keep it in place where you can easily see it. The thermometer portion of this item works perfectly. I also really enjoy the adjustable head that allows me to position the display facing any direction I need it to face. My one complaint would be that the stem is really long and it can be obnoxious to use when working with a small or regular size pot. Great price for this thermometer. Other stores have this for a higher price so if you're already ordering here, adding this item to the bundle is worth it. I like that it's also digital and reads lower temperatures than regular candy thermometers . I purchased this for making caramels and it works great. Accurate to decimal points of a degree. It has a clip to attached it to the side of the pot. I love the digital display. The Taylor 9" Digital Candy/ Deep Fry Thermometer with Pan Clip Adjustable Head is a high quality thermometer. It is highly accurate with temperature readings. I would highly recommend this to anyone looking for a reliable thermometer. My old candy thermometer was so hard to read, so I’m glad I switched to this new digital one. The extra length allows me to use it with my canning supplies too. The large LCD screen with numeric display is easy to read. The clip is solid and stays put when attached to a pot, making it versatile for cooking, candy making, deep frying, and crafts such as soap making. Compact, lightweight and easy to use. I've spent more time jamming this into roasts than using it for candy but it has held up well. The display is large, making it easier to read and the off-button is fab - preventing me from wasting the battery as it lingers on the counter between uses. Cooks best friend. Highly recommended when you have a fryer and serve chicken. The health department made a comment about having the pan clip and said it was a great product. I really appreciate how large the numbers are on this thermometer. While making caramels today, I was able to step away from the pot, clean some dishes in the sink and was able to turn around while cleaning to see the temperature to check their status. I echo the reports of the "inferior" clip but it's not a deal breaker. In fact I really haven't too much of an issue with the clip on my pans. It's just not super user friendly or easy to adjust during use. All in all though, I'd buy it again. Great thermometer to use for boiling sugar for Italian meringue. I use it on a relatively small saucepot and the clip holds fairly well onto the lip of the pot. Great accuracy, which is important when it comes to cooking sugar. I make a lot of Itailian Buttercream and Candy Apples. This thermometer has proven it self durable and accurate in cooking sugar. I will recommended this product. These are the best thermometer. It clips on any pot and the numbers are very easy to read. It allows me to multitask. It also reads cold temperatures. I am very happy with this Taylor Digital Candy and deep fry thermometer. I love that it has a pan clip and adjustable head. It comes with batteries. Absolutely love this thermometer! I use it to make candy, and the ability to clip it on the side of the pan is very useful. The fact that it turns off to save on the battery is just an added bonus. This thermometer works exactly as expected. It has simple operation and a LARGE display. I love that I can check the temperature from the other side of the kitchen. The clip is less secure on shallower pots, but it hasn't cause me much issues. It has a fast read and refresh rate and is accurate within .1 degree. (mine consistently reads 211.9 on a rolling boil, haven't checked for freezing) I would recommend this product. This tool has been a great investment. I can now monitor the temp of liquid ingredients for yeast dough much better than before. I have seen a great improvement in my dough since controlling the temp of the warm milk. The thermometer works great, though does not stay very well on the sides of thin, shallow containers. The tilting readout display is pretty handy and makes for easy reading. This thermometer reads accurately. It clips on easily to my pan to make Italian meringue. There is a button on there that you press so the screen can illuminate which helps because the kitchen can be dimly lit sometimes. This thermometer is great. It's very easy to use and very easy to read. It is precise and the added clip prevents any burning of hands while trying to get a temp. I love this deep fry candy thermometer! It works so well and I love that the face of the thermometer swivels so that you can adjust where it is that you can see it it works so well. I highly recommend it it's tall enough for any pot and the metal clip is adjustable for any size of pot that you use. I used this thermometer for making Swiss Meringue Buttercream. Though it reads the temperature quite well, I have issues with the clip. The clip is very flimsy and does not cling to bowls very well. I don't use thermometers often so this works fine for my occasional use. I just hold the thermometer with my free hand. If you're looking to free your hands by simply attaching a thermometer to a bowl then, I would not recommend this product. Other than that, I like that the display is adjustable and that it is an easy-read digital thermometer. I use this long thermometer to check the temperature on food when cooking on a propane stove for outside events. It's nice to clip to the side of the pot and monitor the temp all the way through. While the thermometer works well, and the temperature is easy to read, the clip is not very sturdy at all. One has to be very careful in handling it. I love this digital thermometer. The digits are large and readable. The clip holds it to the pan so I can fry or boil hands free.